It’s Chilly Outside—Time to Make Chili! One of the best ways to warm up after a winter outing in Northern Michigan, (besides a dip in a hot tub,) is to dig into a big bowl of homemade chili! Chili is one of the easiest dishes to make since all you really have to do is toss a few basic ingredients into a pot, let them simmer away for awhile, and presto…you have a heart-warming, satisfying, thick soup that might be pleasantly spicy, depending on how much spice you choose to add. A basic chili calls for vegetables such as onion and celery, tomatoes, a bean of some kind, typically kidney beans, ground beef if you like meat, and two seasonings: chili powder and cumin. That’s it! The possibilities to vary this simple chili blueprint are many: use white beans instead of kidney, use chicken instead of beef, omit the tomatoes and make it a “white” chili instead, omit the beans altogether, make it super spicy or not spicy at all. 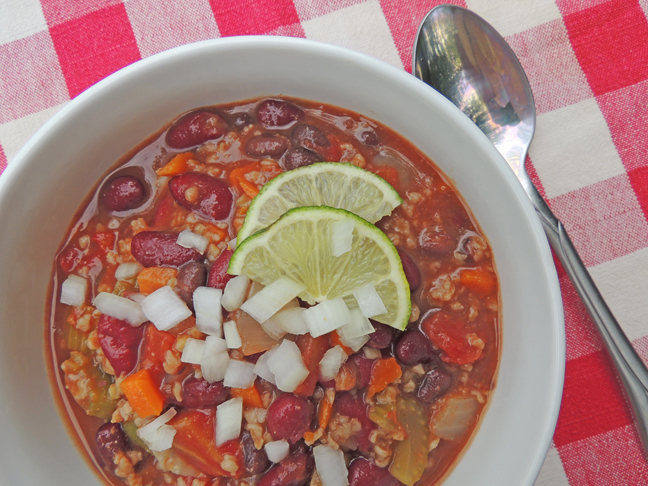 Some variations of vegetables to add to chili include carrots, corn, green chilies, garlic, fresh jalapenos, bell peppers, zucchini, or mushrooms. If you add meat, the meat is typically cooked first and the fat, if any, drained off, before adding the veggies, spices, and tomatoes. Chili powder is the most common seasoning, accompanied by cumin, and it’s the combination of these 2 spices that give chili its distinctive flavor. But other chilies can be used too. Like ancho, chipotle, serrano, habaneros, New Mexico chilies, to name a few. And you can choose any type of bean such as black bean, pinto, or Great Northern. And then to top it all off, let’s talk toppings! Think grated cheddar cheese, sour cream or plain greek-style yogurt, chopped cilantro, corn chips, toasted tortilla strips, chopped green onions, diced avocado, chopped red onion, oyster crackers…hungry yet? Heat oil in a large saucepan over medium heat. Saute onions, carrots, celery, green pepper, and garlic until softened, about 10 minutes. Add chili powder and cook another few minutes. Stir in tomatoes, kidney beans, cumin, oregano, and tomato paste. Bring to a boil, and reduce heat to medium-low. Cover, and simmer for 20 minutes, stirring occasionally. Add seasalt and black pepper or hot sauce to taste. Serve with a dollop of sour cream.